The stare is intense. They live in a different world whenever possible. The only response to any question is something along the lines of “Just a sec” or “Wait. What?” You may already know this type of kid, usually male with a game controller in their hands. Josh Baxter is one of those kids. He’s in a new school again and not liking this starting over routine. It’s even harder as Josh brings with him a few unhappy years he wish he could change. Gaming lovers will especially enjoy this funny plot wrapped up in a serious one. If not, there’s still much to embrace for non-gamers. Josh escapes his problems by playing Tetris, Mario, and a host of others, but soon realizes he needs to take control in the real world. It’s where middle school bullies, poor grades, and family problems seek to smother him with realities. I have this one in mind for boys but hope girls will also give it a go. Embedded in this winning story are a few lessons we should all take to heart. Josh Baxter is sick and tired of hitting the reset button. It’s not easy being the new kid for the third time in two years. One mistake and now the middle school football star is out to get him. And Josh’s sister keeps offering him lame advice about how to make friends, as if he needs her help finding allies! Josh knows that his best bet is to keep his head down and stay under the radar. If no one notices him, nothing can touch him, right? But when Josh’s mom sees his terrible grades and takes away his video games, it’s clear his strategy has failed. Josh needs a new plan, or he’ll never make it to the next level, let alone the next grade. He’s been playing not to lose. It’s time to play to win. Josh keeps track of his real life with a video game like health rating, experience points, and titles of skills unlocked. It’s the only way he knows how to deal with what goes on in a world he is not comfortable in. Josh, his mom, and his perfect sister get the chance to see each other differently. It’s through understanding and listening that this family survives. A loss of a parent is a frequent issue in MG. The approach here is refreshing. Very comforting for those going through the same scenario. Reluctant readers will gravitate toward this one with the manageable page count. Not getting called on in class is the best way to avoid other kids paying attention to you. But avoiding getting noticed in English class is a challenge. Mr. Ramirez in math is easy to fool, but Ms. Pritchard has the eyes of a seer, able to tell the future from tea leaves or divine the fact that you didn’t do your writing homework from the guilty expression on your face. This is my first novel, but I’ve written short stories and novellas for kids’ series like Spirit Animals and The 39 Clues. When I was a little kid I was in a ballet based on Star Trek. I portrayed the villain after he went through a shrink ray. I’m also a video game designer. I made the Spirit Animals game for Scholastic, and created an indie game called Blindscape from the perspective of a character who’s lost his vision. I once had a fencing duel with a tree and wound up in the ER with hole punched in my leg. The tree appeared uninjured. 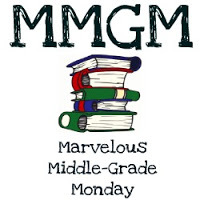 This entry was posted in Reviews and tagged Gavin Brown, Josh Baxter Levels Up, Marvelous Middle Grade Monday, MG book reviews, Middle grade. Bookmark the permalink. Sounds like a great story that a lot of kids would like. So many of them love video games. I’m not really the video-game type of person, but the summary interests me. Thanks for the review! I have a reluctant reader that may like this one. He seems to have a lot i common with the protagonist. I am going to check it out of the library this week for him. Thanks for the suggestion. Sounds like a quick, fun read! I love that he thinks in terms of what his heroes would do. 😀 Thanks for the recommend, and happy MMGM! I really like what the author had to say about himself, especially the fencing comment. Although I’m not a gamer myself, I can see how this would really appeal to boys. It sounds like a good read that has a lot of depth. Thanks for sharing this! I’m interested in how he uses the video game. Sounds like a good story! I can see how reluctant readers would be drawn to a fast-paced story about gaming. It does sound like a refreshing way to deal with loneliness and grief. This sounds like a great book to get non-readers reading. Thanks for the heads up.